Najee Omar, a Brooklyn-based writer and performance artist, uses the language of theatre, music, and poetry to create an honest dialogue around the injustices of humanity. Avery Fisher Hall, Au Chat Noir (Paris), and Duke University. As a teaching artist, he’s turned classrooms into stages by conducting poetry and theatre workshops for inner city teens and at-risk youth in schools across the greater New York City and Los Angeles areas. 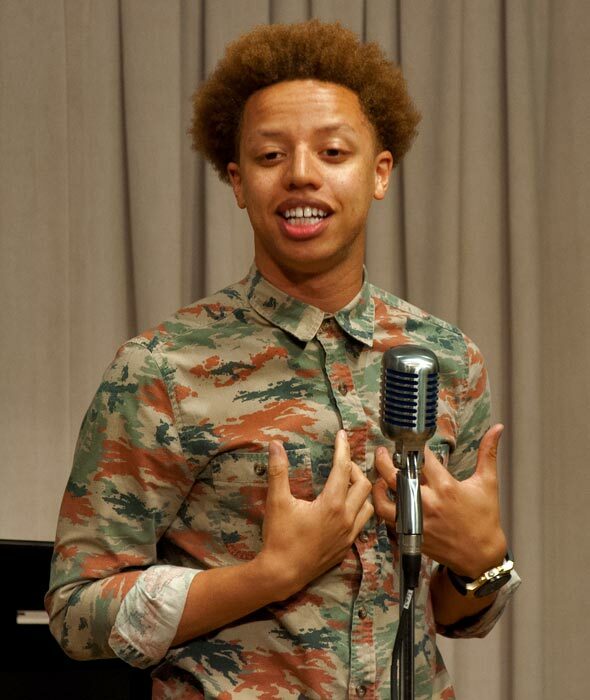 In 2012 Najee was awarded the Poet-in-Paris Fellowship. He currently serves on the HigherSelf Arts Committee as the curator of artist showcases and co-host of its monthly Open Mic Series. Najee’s mission is to cultivate an audience of deep thinkers and inspire the next generation of change agents.